The Posture Pump® is an easy to use device designed to relieve pain in the neck and back. Much of the pain people experience in their neck and back is due to poor posture. Bad posture can cause unnatural curves in the spinal cord leading to a loss of the lubricating fluid between the discs, causing discomfort and stiffness. Posture Pump® relieves this spinal pressure and corrects posture by slowly pressing on the neck and lower back areas. You only need to use the device once a day for around 5 to 15 minutes. It can be used easily while laying down on the bed or floor. Posture Pump® works by slowly applying and removing the pressure to the neck and lower back. 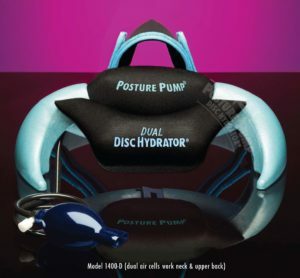 With easy to use hand pumps and uniquely angled air cells, expansion and contraction (up and down motion) of these air cells create alternating hydration of the spinal discs and joints. When the air cells are left inflated for longer periods of time (15-20 min. ), postural restoration occurs. The two air cells decompress and shape the neck and upper back to adjust the forward upper body posture. Versions for just the neck and back are also available. Posture Pump® corrects posture by applying pressure to the spinal cord, which over time allows the spine the rest in its original position, decompressing and hydrating compressed discs and decreasing painful disc bulging. This restores and maintains the natural curve of the neck and relieves neck pain and upper back stiffness. It also helps to alleviate headaches and fatigue. Posture Pump® has been praised by many medical professionals (such as Dr. John Bergman) and has also been proven by medical studies. It has been used in over 3 million cases worldwide as an alternative to simply being prescribed pain medication which does not solve the problem. 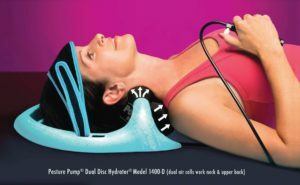 Studies have found that disc dehydration from poor posture is a common cause of chronic neck and back pain and the Posture Pump® is an effective and supportive way to use the body’s biomechanics to restore the neck curve and alleviate discomfort. One of the best things about this product is its convenience. Unlike some products, you do not need to wear this product for hours of your day. You can keep it on your bed or on your floor and use it for only 5-15 minutes a day with amazing results. You can also use this product in combination with other products, as it does not require you to use it throughout your day. This is a good choice for those who use a corrective brace or chair at work and are still looking for extra help. It can also be used in conjunction with chiropractor care. After just a few uses, you will notice better neck posture and improved shoulder curvature. There are several made in the USA models to choose from. The company offers a 60-day risk-free money back guarantee. I was immediately impressed by the amount of literature and studies provided with the pump. The instructions are not complicated, but they seem a bit intimidating at first. To use the pump, you simply lay down on your back and place your neck on the bar area of the pump. It is important to place the pump as close to your shoulders and back as possible, as this will ensure proper use. I noticed an immediate improvement in my posture by laying in this position on the pump. It forces you to have good upper posture by placing pressure on your neck. This becomes the most comfortable way to lay down. After laying on the product, you put on the head strap by placing it over your forehead and then securing the strap by pulling both sides and attaching the Velcro strips. It is easy to pull the straps too tight, which I did at first, but the Velcro makes it simple to loosen and adjust them for the right fit. Wearing the head strap looked and felt a bit odd, at first, and I considered ignoring this part of the instructions. However, during use, I realized it performs a crucial part of the process. The head strap keeps your head fixed in place, so you don’t move during the pumping process. Placement is critical because it ensures the pump is placing pressure on the correct part of your spine. I was very pleased with the first use of the product and already felt an improvement of my posture and a noticeable lack of neck pain. The second time I used the Posture Pump® was after a two-hour drive, something that always bothered my back because my posture is not always the best when hunched over the wheel of my vehicle. I found myself looking forward to using the pump, hoping it would relieve some of the tension built up from the long ride. Getting used to regular use of the pump felt like getting used to a new exercise. The first few times are uncomfortable, but it gets better with time. Incorporating it into your daily routine is an excellent choice if you are looking to use this product regularly. This ensures you will continue to use the product consistently and allows you to feel more comfortable with it over time. After the third use of the product, I gradually increased the amount of time I pumped it up each time. After the fifth use, I could hold it pumped up for about a minute and could do this several times in a row. Even after the fifth use, it seemed like there was a difference in my neck posture while looking in the mirror. Posture Pump® is highly recommended by Doctors, is made in America, is simple to operate, easy to pack if you are traveling, has an excellent return policy and offers many health benefits. I highly recommend this product, especially if you do a lot of driving, sitting at a desk or even look at your phone frequently. A stiff neck and the headaches and other discomforts can be easily resolved using the posture pump only a few minutes each day.